Gender does not appear to predict retention in substance abuse treatment. Women are as likely as men to stay in treatment once treatment is initiated. and other integrated and comprehensive treatment services. Sociodemographics also play a role in treatment retention. Studies suggest that support and participation of significant others, being older, and having at least a high school education are important factors that improve retention. 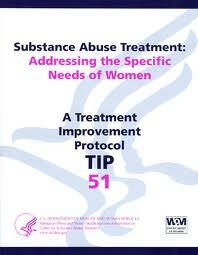 Criminal justice system or child protective service involvement also is associated with longer lengths of treatment. Women are more likely to stay in treatment if they have had prior successful experiences in other life areas and possess confidence in the treatment process and outcome. Although pregnancy may motivate women in initiating treatment, studies suggest that pregnant women do not stay in treatment as long and that retention may be significantly affected by stage of pregnancy and the presence of co-occurring psychiatric disorders. Limited research is available highlighting specific therapeutic approaches for women outside of trauma-informed services. In recent years, more attention has been given to effective women’s treatment programming across systems with considerable emphasis on integrated care and the identification of specific treatment issues and needs for women. Gender specific factors that influence the treatment process and recovery evolve around the importance of relationships, the influence of family, the role of substance use in sexuality, the prevalence and history of trauma and violence, and common patterns of co-occurring disorders. Among women with substance use and co-occurring mental disorders, diagnoses of posttraumatic stress and other anxiety disorders, postpartum depression and other mood disorders, and eating disorders are more prevalent than among men who are in treatment for substance use disorders. Consequently, clinical strategies, treatment programming, and administrative treatment policies must address these issues to adequately treat women. Likewise, women often need clinical and treatment services tailored to effectively address pregnancy, child care, children services, and parenting skills. • Promote cultural competence specific to women. • Recognize the role as well as the significance of relationships in women’s lives. • Know how to address women’s unique health concerns. • Understand the elements of endorsing a developmental perspective. • Attend to the relevance and influence of various caregiver roles that women often assume throughout the course of their lives. societal attitudes toward women who abuse substances. • Adopt a trauma-informed perspective. • Use a strengths-based model for women’s treatment. • Describe the importance of maintaining a gender responsive treatment environment across settings. • Know the specifics of supporting the development of gender competency regarding women’s issues.